Six cars sold for more than a million dollar at the Bonhams 2015 Mercedes Benz Museum classic car auction in Stuttgart. Top result was 1938 Mercedes Benz 540 K Cabriolet A sold for €2,760,000 while four 300 SLs sold for over a million dollar each. Bonhams held its second annual Mercedes-Benz single marque classic car auction at the Mercedes Benz Museum in Stuttgart, Germany, on 28 March 2015. Around 45 Mercedes Benz cars were on offer ranging in age from a 1900 Benz to a 2007 Mercedes Benz SLR McLaren. Car models on offer ranged from Unimogs to DTM racing saloons and standard Mercedes Benz cars. A remarkable large number of the cars were cabriolet and roadsters. Prices include premium. Sale was in euro, US$ conversion as stated by Bonhams on day of auction. The Mercedes Benz 540 K (K for compressor) was one of very few production cars during the 1930s that could exceed a 100 mph. Only 409 of the 540 Ks were ever produced making the survivors amongst the most expensive Mercedes Benz cars sold at auction. The 1931 Mercedes Benz 770 Cabriolet D that achieved €2,311,500 at the sale was one of only 18 produced with the D’s four-door bodywork. Bonhams had four of the classic 1950s, early 1960s Mercedes Benz 300 SLs on offer at the Stuttgart sale. Several of these cars failed to sell at recent auctions but the estimates – and reserve margins – at the Mercedes Benz Museum sale were realistic and all four sold at the lower end of the pre-auction estimates. The highest price was paid for the car with the lowest pre-auction estimate: €1,121,250 for the 1960 Mercedes Benz 300 SL Roadster that came from the famous Krupp industrialist family. A Gullwing Coupé and two further Roadsters sold for just over a million euro. See: 2015 Bonhams Mercedes Benz Sale Preview for a fuller description. €10,925 was paid for a 1925 Mercedes Type 8 Ladies’ Bicycle. At the 2015 Geneva Auto Show almost every premium carmaker had a bicycle, often of its own brand, on show. However, Mercedes used to make bicycles as far ago as the immediate post-First World War years. Many German industries were prohibited from producing anything of a military nature forcing many into new products rather than letting factories stand idle. The Mercedes plant in Berlin turned to making bicycles, while BMW produced cooking utensils before turning to motorcycles. The oldest car on offer at the 2015 Bonhams Mercedes Benz classic car auction was a 1900 Benz Ideal 4½ HP Single cylinder vis-à-vis that achieved €212,750. The car was originally probably delivered to the UK and in recent years has participated in several times in the London to Brighton Run. The large Mercedes Benz 500s were the most prestigious cars produced by Mercedes Benz during the 1930s but it was smaller cars such as the 300 series that were the commercial base of the company. 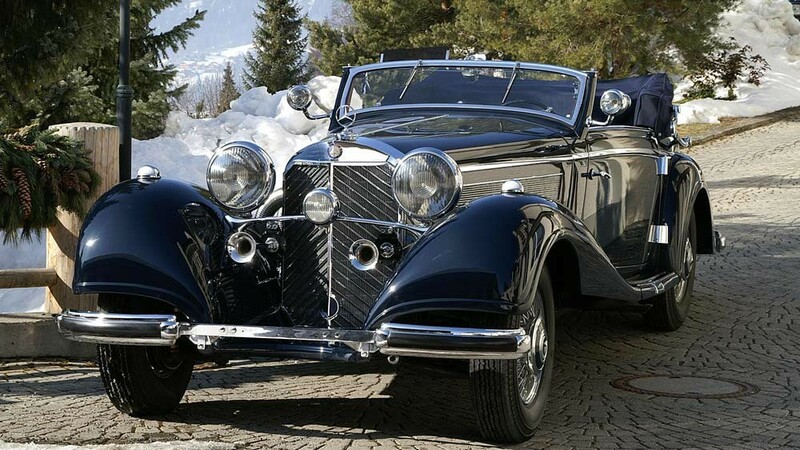 Such a 1931 Mercedes Benz 15/75 PS Mannheim 370 S Sport Cabriolet achieved a strong €552,000. The Mercedes Benz 300 S cars of the mid-1950s were more expensive and far more exclusive than the more famous 300 SL models of the same period. It was fitted with the same basic engine as the sporty SLs but with a more comfortable and far more luxurious body. Only 760 Mercedes Benz 300 S cars were built of which only 203 were S Cabriolets and only 49 were Sc Cabriolets. Despite this exclusivity, the 1954 Mercedes Benz 300 S Cabriolet A achieved only €465,750 – less than half what a 300 SL usually sells for nowadays. A Sc cabriolet sold for $1.1 million at RM Sotheby’s Amelia Island sale in mid-March 2015. A 1957 Mercedes Benz 300 Sc Coupé in very good condition sold for a strong €572,700 – only 98 cars were built in this body style. The newest car on offer at the Bonhams sale was a 2007 Mercedes Benz SLR McLaren Roadster that belonged to “an old lady”. The consignor bought it for her 70th birthday, as she wanted to acquire the company’s flagship model, and covered on 19,000 km with it. Mercedes Benz produced only 2,144 SLR McLarens – well short of the planned 3,500 with only around 850 as roadsters. The car on offer achieved €284,050 – the original price was €440,000. Bonhams next major classic car auction will be in May – Aston Martin Works sale, Spa and Greenwich – but the top results of the year are more likely to come at the Goodwood Festival of Speed Sale in June and the Quail Lodge auction in mid-August.